Moisturizes and softens the skin after sun exposure. 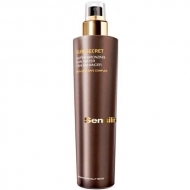 DESCRIPTION: Sun Secret After Sun Serum from Sensilis is a lightweight, ultra-comfortable facial that moisturizes and soothes your skin after exposure to the sun. Thanks to its innovative formula with DNA Safe Complex and a soothing / repairing complex, it prevents skin aging, moisturizes and regenerates damaged tissues by sun exposure, counteracting the formation of wrinkles. The most flexible, silky skin and tan remains long lasting and even. Transparent texture of light colour and fresh, of fast absorption. Apply on clean and dry skin on the face after exposure to the sun.